Vice-Director Masanobu Kohagura, right, receiving the certificate. The Ministry of Education, Culture, Sports, Science and Technology (MEXT) held an award ceremony for the year 2015 at the ministry office on March 9 to acknowledge businesses that promote experience-based youth programs. 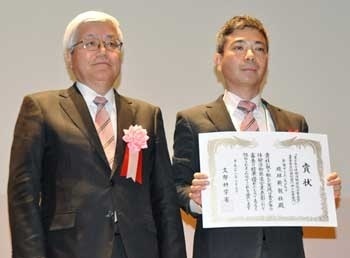 The ministry awarded “Shimpo Science Club”, hosted by Ryukyu Shimpo (co-sponsored by Okinawa Churaumi Foundation), with a special award from the selection committee for the Minor Business Category. The Ryukyu Shimpo’s project started in 2011. It provides research grants for elementary and junior high school students who study and present findings on Okinawan nature, animals and plants. As many as 436 students have participated in the project in five years. Its participants have received awards from the prefectural governor at the Exhibition of the Science-Work by Students in Okinawa and from the Natural Science Study Competition held by Mainichi Shimbun. MEXT acknowledged its educational work and outcomes. Vice-Director Kohagura attended a symposium after the ceremony and joined discussions on the role of business in enriching young people’s experiences.